Now THIS is a Southern stingray! Dive Journal: We meet up again with Anna and Derrick at the Fredericksted pier and this time we’ve got Johnny with us. We motor down south to an area near Sandy Point, the far southwest point of St. Croix. There is some current here and we have a drift dive planned for this morning. The dive starts out at one mooring ball in about 70 feet of water, and ends at the next one about 3 or 4 tenths of a mile away in about 60 feet of water. We see plenty of great stuff on this dive, starting with a tremendously huge Caribbean spiny lobster, surrounded by smaller ones. We decide it looks like the Brady family, yes Brady lobsters. There is soon a huge mutton snapper who comes by, then three or four turtles (both hawkbill and green). We enjoy a tremendous southern stingray, maybe the largest one I’ve ever seen. 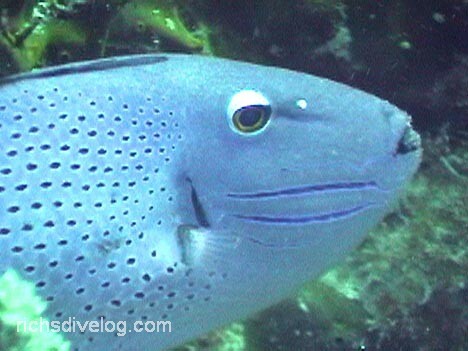 Then some great looking sargassum triggerfish, a white spotted moray eel, and a school Atlantic spadefish. 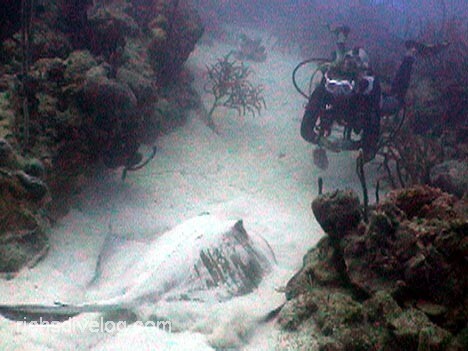 This is one of the best dives we’ve done in St Croix.